Vauxhall, and sibling Opel, is to debut a next-generation electric Corsa and a plug-in hybrid version of its Grandland X crossover by 2020 under post-takeover plans to bring the company back into profit. Revealed by recently appointed Opel CEO Michael Lohscheller 100 days after PSA’s acquisition of the carmaker closed, the PACE! performance plan is intended to secure the future for both brands, bringing them back to profit by 2020 and lowering the financial break-even point to 800,000 vehicles with improved efficiency. 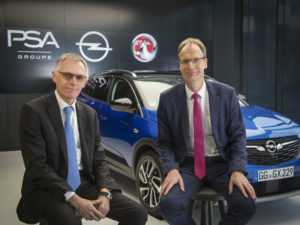 The plan is for all plants to remain open – including Ellesmere Port in the UK – and to undergo modernisation and “refrain from forced redundancies”, while there will be combined synergies and a focus on ‘electrified vehicles’ to turn Opel into a “sustainable, profitable, electrified, and global company”. This includes an accelerated shift to using PSA’s CMP and EMP2 platforms to underpin all future Vauxhall/Opel passenger car models from 2024 – three years earlier than planned – reducing the number of platforms from the current level of nine. PSA engines and transmissions will also be used in all models. Vauxhall/Opel will also make use of PSA’s electric drivetrains in future models, with plans for four ‘electrified’ models on the market by 2020, including the Grandland X PHEV and electric Corsa. All passenger carlines will be “electrified” by 2024 – meaning that they will offer a fully electric or plug-in hybrid version alongside “efficient” internal combustion engines, likely to mean mild hybrid usage. The plans also look to explore fuel cells and automated driving technologies. Plans for the light commercial vehicle (LCV) business will also see Vauxhall/Opel launch new models and enter new markets with the clear goal to increase its LCV sales by 25% by 2020 against 2017. The brand also said there would be more attractive financial offerings as well as full service leasing offers via the Financial Services of Opel and Vauxhall. Vauxhall/Opel will also expand into more than 20 new export markets by 2022 with the brand to also explore “global midterm overseas profitable export opportunities”. “PACE! will unleash our full potential. This plan is paramount for the company, to protect our employees against headwinds and turn Vauxhall/Opel into a sustainable, profitable, electrified, and global company. Our future will be secured and we will contribute with German excellence to the Groupe PSA development,” said Michael Lohscheller.